This shot made me think of Saul Leiter, although in black and white. The Girl and I got out early Saturday morning. I wanted to get a bite and this morning I wanted to visit Grandma Hattie’s, a favorite local diner. We also wanted a walk, but neither of us wanted to walk in the rain. I could have because I have good gear. But the Girl does not like to be wet and does not (yet) have a raincoat. So, we made a short walk so she could take care of business and then we hopped into the rig to run a few errands. Breakfast was nice and she appreciated her purple shag rug (many thanks, Lucinda) under the table. She was warm and dry while I ate my breakfast and drank my coffee. I even set aside half my bacon for her (for later). Breakfast over, we returned to the rig where I removed her vest and gave her her treat. She loves bacon, almost as much as chicken. She enjoyed the warm seat (I ran the bun warmers) on the way to pick up my mail. 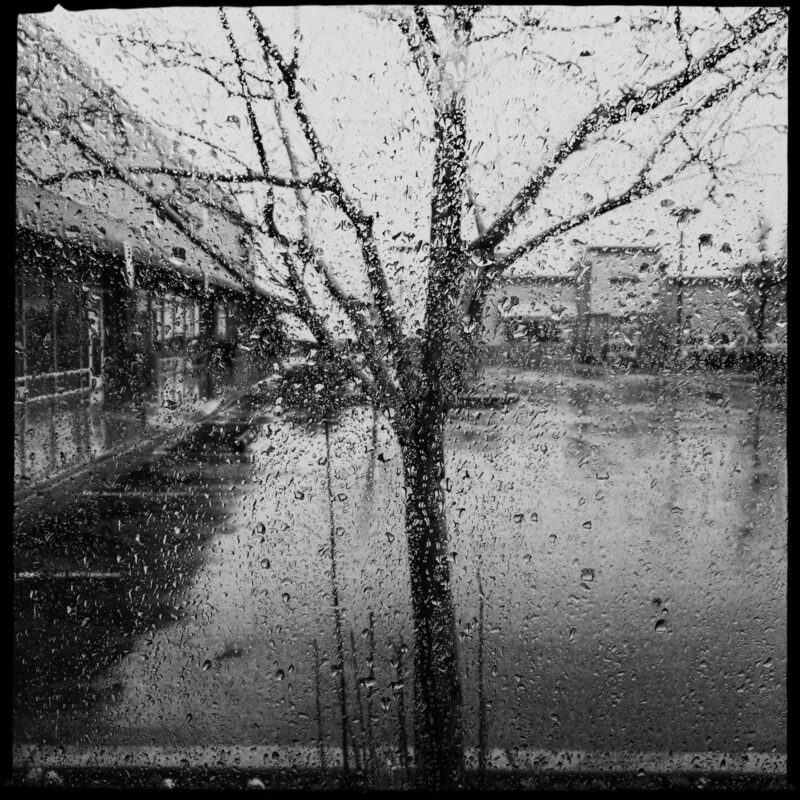 While I waited for the UPS Store to open, I noticed the rain on the window and made the capture. The capture made me think of Saul Leiter, a wonderful artist and photographer whose work I admire. I’ll have to watch the documentary made of him again, once I set up my television. I was pleased that there was payment for some work in the mail. We then drove over to Best Buy so I could buy a small microwave oven. I miss having an easy way to warm something. I found a solid unit for not much money and picked it up. We drove home, where the Girl went off to nap away the rainy day. I worked on my unpacking for several hours. I’m clearing the garage of boxes and loading my bookshelves. A number of the books brought a tear to my eye, bringing memories of loved ones now gone. I shared a image with Daughter of one of her favorite childhood books, In the Land of Sniggl-dee-Bloop. I must have read that book a thousand times. I would happily read it again, another thousand times. The language is fun and the story is interesting. It is a good book. Those times spent with my children remain precious in my memories. Soon I will work through the bulk of my unpacking. It will then be time to organize my things and look at them once again to determine what I will keep and what will go. There is no reason to hang onto things unless they have utility or significant meaning. Everything else can go to someone who needs them or wants them. I am good with that.